DeWALT is a subsidiary of Stanley Black & Decker. It’s an American worldwide brand, manufacturing power and hand tools for construction, manufacturing and woodworking industries. Parts are manufactured in Brazil, China, Italy, Mexico, the UK, the US and the Czech Republic. However, many products are assembled in its seven manufacturing facilities around the US. DeWALT as a manufacturer and quality brand had humble beginnings when it was started in 1923 by Raymond E. DeWALT. Raymond was the inventor of the radial arm saw and he soon had a following which would see his project business grow. It became a company and was then reincorporated in 1947 as DeWALT Inc. Today, DeWALT manufactures and sells over 200 power and hand tools around the world, and 800 accessories to accompany them. Although DeWALT only offer a small range of chainsaws, what they do have for sale on the market is good buying. Featuring Oregon chains, three year warranties and pure electric convenience, it’s little wonder they have been top rated online. 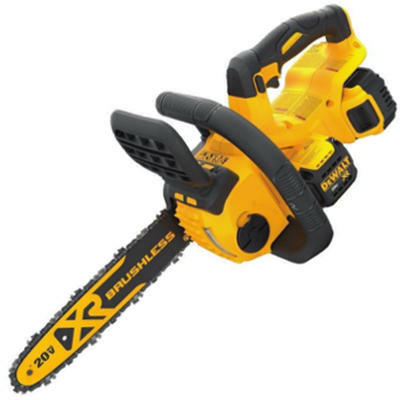 Their range includes the 40V Max Lithium Ion Brushless 16 inch chainsaw and the Flexvolt 60V Max Brushless chainsaw. 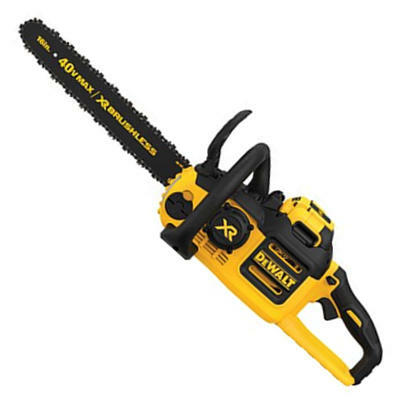 Both come highly recommended by DeWALT as quality chainsaws without the large price tag. The best thing about DeWALT electric powered chainsaws is the parts can be replaced at very little cost as well. It has a low kickback chain and chain brake as added safety features. It auto-oils for user convenience. It’s on the higher end in cost on the market. The battery doesn’t last very long. You can’t take it too far from a power source unless you have backup batteries. Dimensions: 9 x 35 x 10 inches. You get what you pay for, and you certainly get a lot when it comes to this 16 inch DeWALT electric powered chainsaw. Even though it’s not the cheapest chainsaw on the market, for the cost, you get a lot of bang for your buck. The biggest benefits, however, are reliability, quality parts and safety. This DeWALT chainsaw is top rated on the market for these reasons. It’s clear to see it’s one of the best DeWALT chainsaws for the money. Check out what other people who purchased this product think about it. Read DeWALT DCCS670X1 cordless electric chainsaw reviews. It has a powerful and reliable brushless motor. It’s easy to start at the push of a button. You need to remain near a power source unless you have backup batteries. It’s not a commercial grade or professional saw, so it’s limited to homeowners. Dimensions: 9.4 x 36 x 9.3 inches. 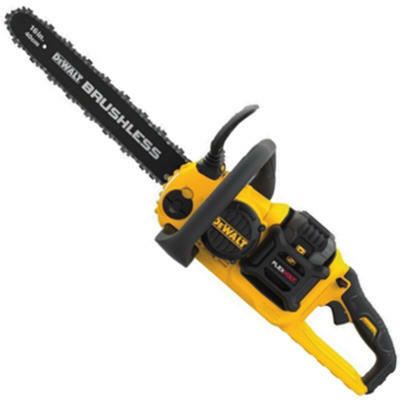 QDoes the battery and charger come with this chainsaw? AFor up to approximately 70 cuts. QCan the battery be interchangeable with other DeWALT power tools? AYes, other 40V power tools. This top handle chainsaw delivers on power and reliability every time. When you’re after a chainsaw which continues to give and keep on giving when you’re clearing your yard, this is the saw for you. It’s top rated on the market for its quality design, and it has a considerable amount of power in comparison to other brands and models of similar spec. To get the best deal, shop around and get more bang for your buck online. Check out what other people who purchased this product think about it. Read DeWALT DCCS690H1 cordless electric chainsaw reviews. It has a high efficiency brushless motor which will increase run time and the life of the motor. It’s very nimble and lightweight. You have to be near a power source or carry backup batteries. The battery life isn’t that good. Dimensions: 9 x 9 x 25 inches. A20V Max 5Ah Lithium Ion battery. AFor up to approximately 30 cuts. AYes, other 20V power tools. Once again DeWALT has come to the party to deliver a quality, powerful electric powered chainsaw worth its weight in gold. Not only is it affordable for those looking for a reliable and well known brand of chainsaw, but it’s also top rated and delivers unbelievable power from its brushless motor. It requires minimal maintenance, replacement parts are cost effective, and it’s available for sale in many stores and online for buyer convenience. It really is one of the best, DeWALT chainsaws for the money. Check out what other people who purchased this product think about it. Read DeWALT DCCS620P1 cordless electric chainsaw reviews. DeWALT, as a subsidiary of Stanley Black & Decker. Where are DeWALT chainsaws made? They are made from globally manufactured parts in many states in the US. Where do you buy DeWALT chainsaws? DeWALT chainsaws can be purchased at many hardware and retail stores around the world. They can also be purchased online on websites such as Amazon.